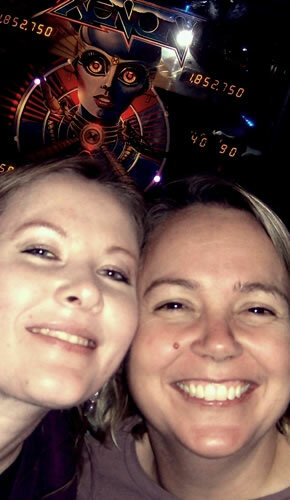 Location: Pacific Pinball Museum, 1510 Webster Street, Alameda, CA 94501, USA. 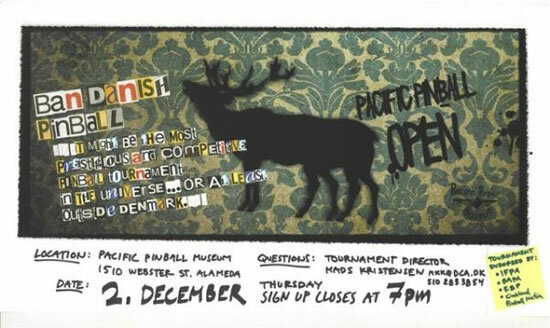 On December 2nd, 2010, the Pacific Pinball Museum held its first IFPA-sanctioned pinball tournament, fittingly named The Pacific Pinball Open. Mads Kristensen, a visiting player from Denmark, took the helm as tournament director and the event doubled as his big send-off party after nearly a year in the States. Mads has made many friends and had many pinball adventures, and the response was amazing with 47 competitors and a couple dozen other friends and spectators. Qualifying consisted of playing three games only one time each, with warm-up allowed right up to the start of qualifiers. Such a thrifty and brutal qualifier was needed since the event took place on a Thursday evening and time was tight. So many players turned up that two separate divisions were needed, yet they weren’t of the Pro and Novice variety. Skilled players were divided as evenly as possible and the top players in each division advanced to a mixed playoff. Of course, since the tournament took place in a pinball museum it was only fitting the games should reflect pinball’s history. 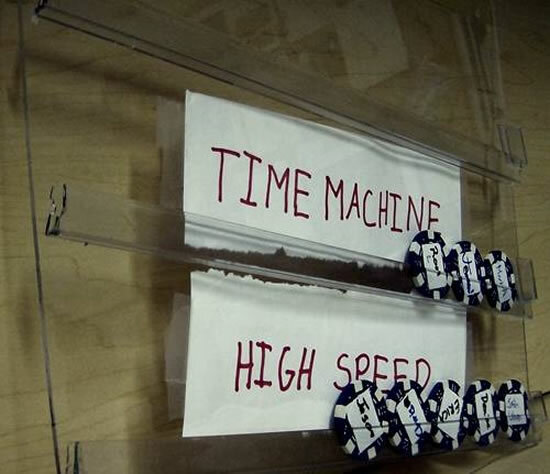 Division A played Avatar, Time Machine and El Dorado. Division B played Ironman, High Speed and Volley. Volley and El Dorado proved especially challenging since nudging is a key skill on both yet a tilt doesn’t just end the ball, but the game altogether. I got a painful reminder of this when I titled ball three (of five) on Volley, which along with a ho-hum Ironman score, served to dispel any thoughts of glory that night. Each player was issued a poker chip with their name on it to queue up for games. The system takes the burden off scorekeepers, and players can see-at-a-glance if their turn is coming up. Happy scorekeepers translates to accurate results. 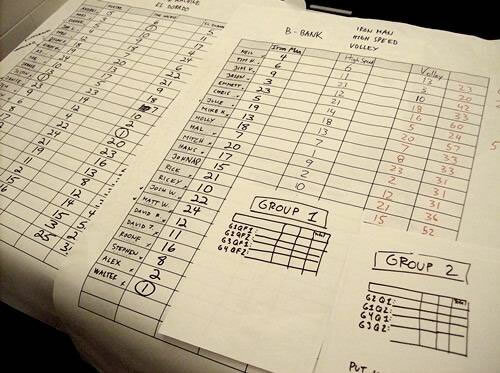 Results were initially tracked on large score sheets near the machines, and then the order of place was transferred to a second set to add up the points for each division. This determined who would move on to the quarter-finals. The twist for this particular tournament was the top scorer on each game was guaranteed a spot in the play-offs. After that, the top 5 players in each division who hadn’t already won a spot via top score also advanced, for a total of 16 players across two divisions. Like all tournaments, the Pacific Pinball Open was competitive and several players were certainly gunning to win, but it was mostly about everyone having a great time. 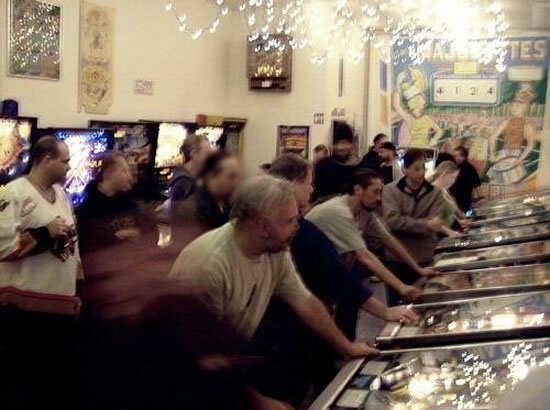 The simple, relaxed format, short length, pizza and beer brought out a fun and eclectic crowd of pinball pros, hipsters, artists and spectators. Prizes were simple, consisting of posters, T-shirts, and PPM Club Cards. Oh, and eternal fame, as you’ll soon see. 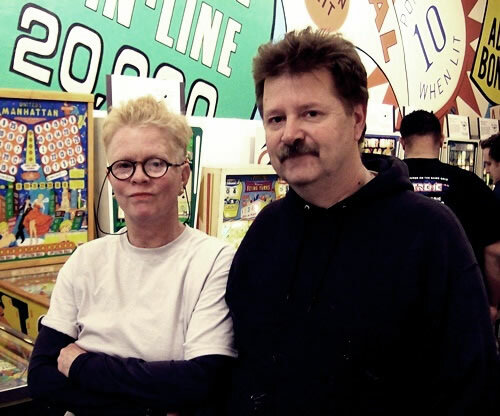 his incredible murals seen at pinball shows and around the Bay Area. 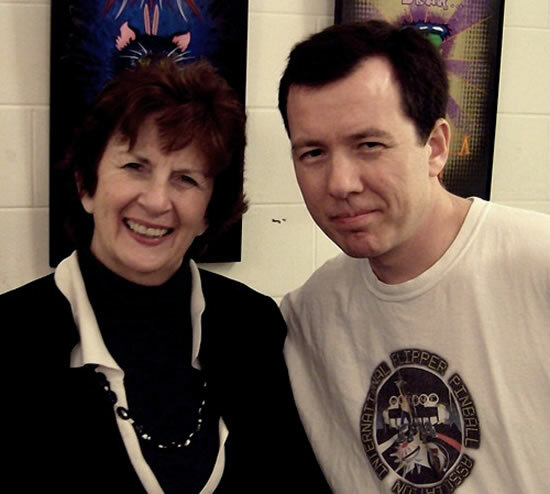 Molly Reisman and Eugene Gershtein. 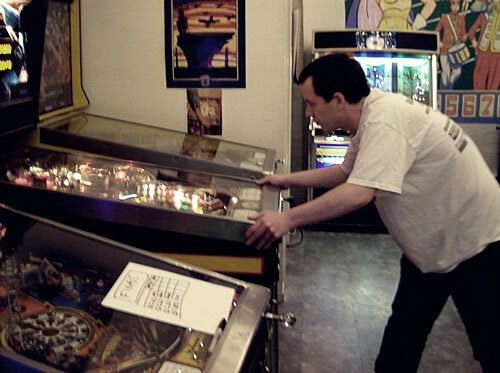 Eugene is the President of the Bay Area Pinball Association. I told Gem to eat pizza and look angry and he angrily obliged. 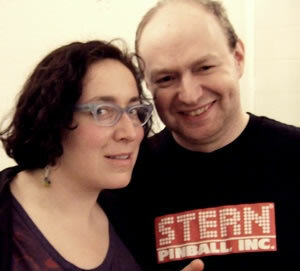 Gem Gruber is also a principal of the Pacific Pinball Museum. Walter, Ricky, David and one other player failed to make the final four. When the final four made their way to the last game it was nearly one o’clock in the morning. A couple dozen spectators valiantly stayed to see who would emerge victorious. In keeping with a historical theme, the only fair way to determine the newest champ was to decide the matter on the newest game: Avatar. 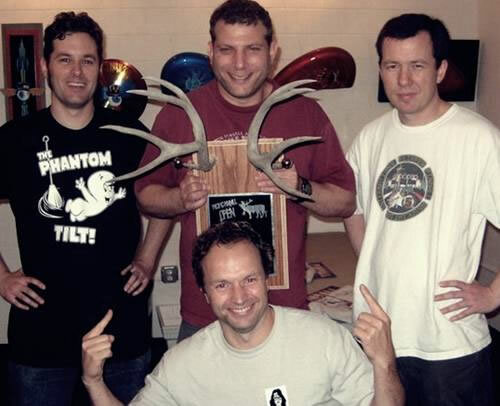 In the end it was a solid second ball that propelled longtime Bay Area legend Neil Shatz to victory, a victory which rather nicely compliments his win at the Pacific Pinball Exposition two months prior. About that eternal fame I mentioned. 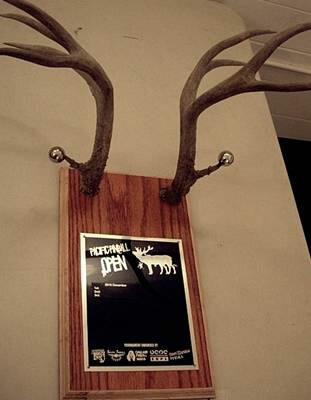 Michael Schiess, the owner of the Pacific Pinball Museum created a special wall plaque for the tournament. The amazing looking plaque is to hang on the wall in perpetuity at the Pacific Pinball Museum to showcase the names of the top three finishers. Congratulations to all! The evening was a phenomenal success with the highest turnout for a local tournament in at least ten years and likely more. Good luck to Mads Kristensen as he leaves our fair shores in search of his next big adventure. We’ll all miss you. Mads Kristensen, tournament organizer and director. 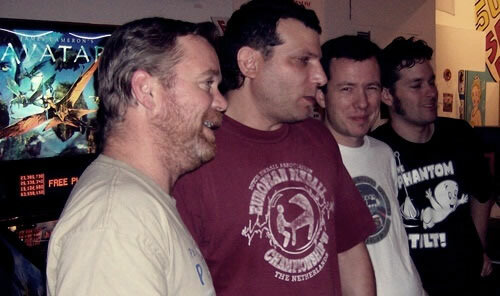 Michael Schiess and the staff of the Pacific Pinball Museum. Scorekeepers: Walter Hurwitz, Alex Samonte, Mark Altvater, Jeannie Rodriguez, and other names I unfortunately didn’t get down. 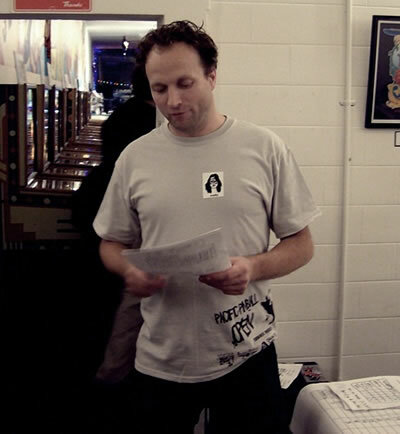 Beer: Kevin Reikki and the Oakland Pinball Mafia. All the players who turned out on what otherwise would have been just a rainy and dreary Thursday night.